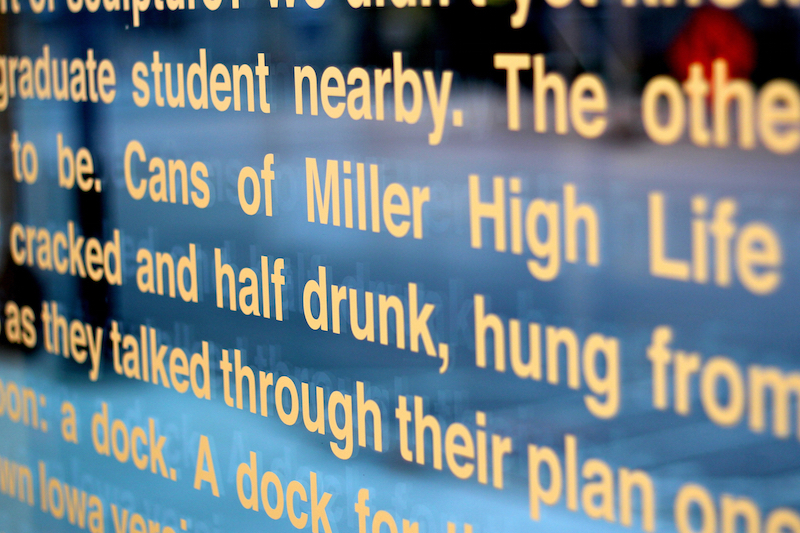 Whether statues, sculptures or graffiti, public art is a relatively common sight, but there are fewer opportunities for the public to stumble upon new works of creative writing without the sometimes-intimidating commitment to opening the cover of a book. This limits the public's exposure to new authors and contemporary writing. 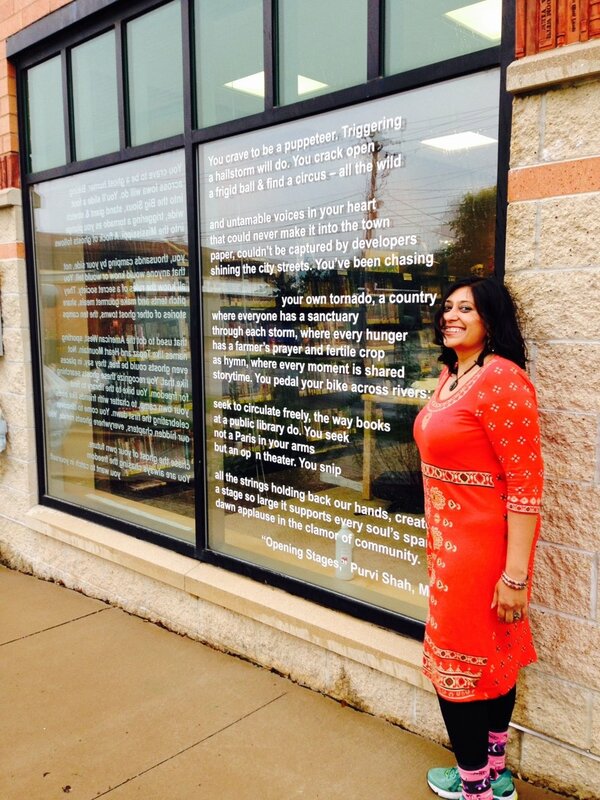 In 2014, Molly began "Public Writing, Public Libraries," a Grin City Collective project that installed, in vinyl film, short works or excerpts of fiction, nonfiction and poetry in the windows of Iowa libraries. 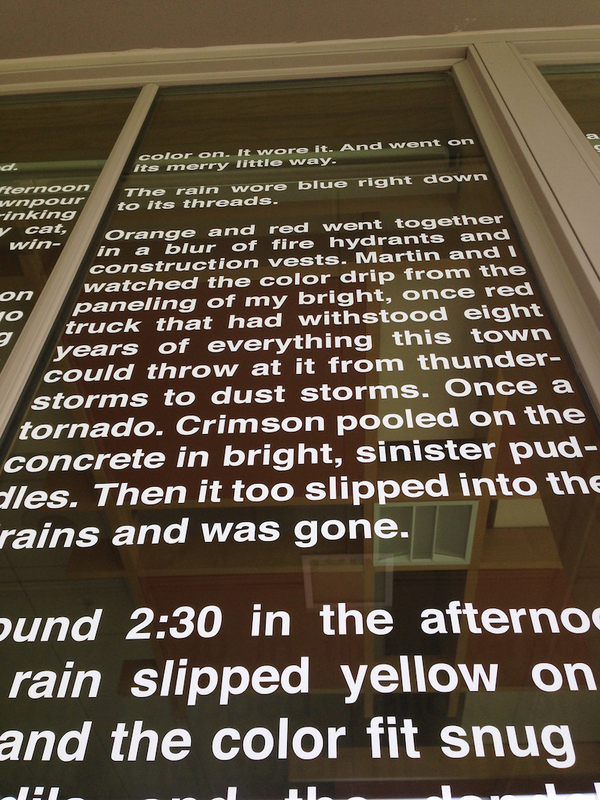 The writing is visible from either the inside or outside of the building and attracts patrons into the library to read the full piece. Phase 1 (2014) Drake Community Library (Grinnell, IA): Molly Rideout's "The Day the Colors Left," Kevin Haworth's excerpts from "Plagues," and Emma Saperstein's "Anthony." Phase 2 (2015) 12 Iowa libraries partnered with poet Pauliina Haasjoki (Helsinki, Finland), Kevin Haworth (Athens, OH), Molly Rideout (Grinnell, IA) and Purvi Shah (Brooklyn, NY). Participating libraries were: Newton Public Library, Marshalltown Public Library, Cedar Rapids Public Library, Coralville Public Library, Waterloo Public Library, Cedar Falls Public Library, Tama Public Library, Toledo Public Library, Pella Public Library, Knoxville Public Library, North Liberty Public Library and Grinnell College Burling Library. 4 weeks, 6,600 words, 1200 sq feet of vinyl film, 2,000 miles of driving, and hundreds of hours. Photos below of Molly's original work at the Cedar Rapids, Toledo and Newton Public Libraries and Drake Community Library. 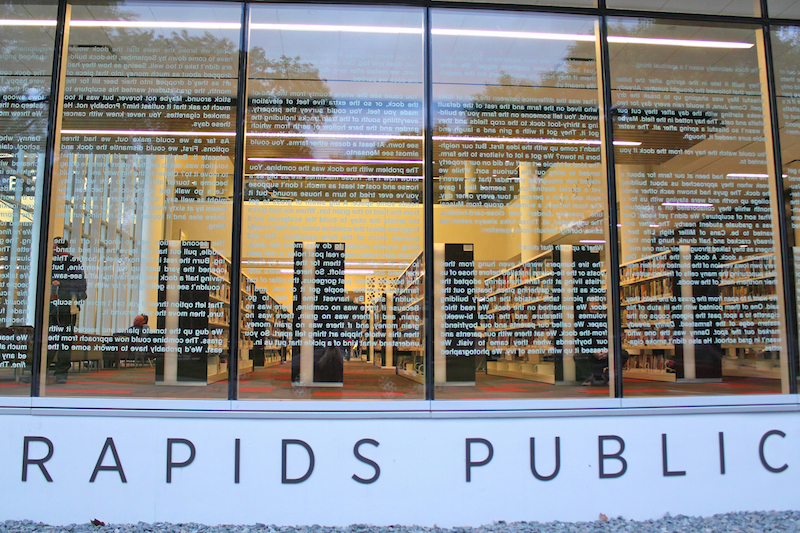 A mirror poem installed to face half-inside, half-outside the teen section of the library. 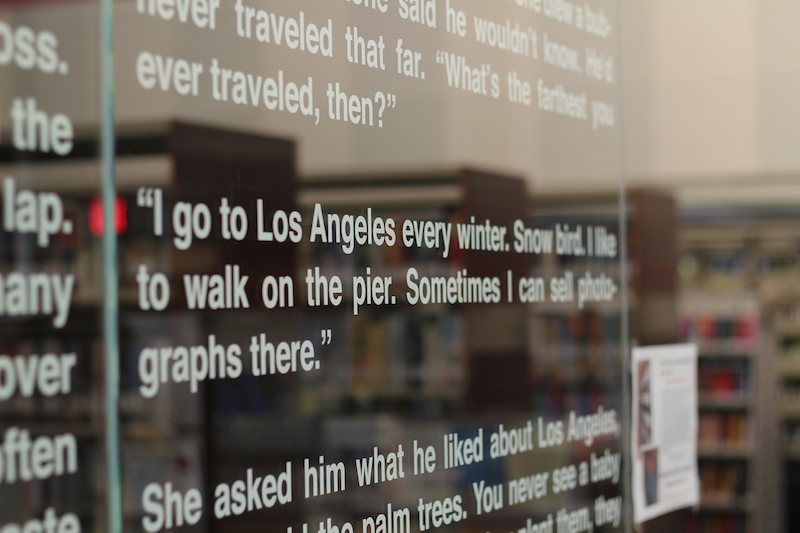 We installed different strands of Kevin’s braided essay at three public libraries, so that the reader can understand it alone or by visiting all three libraries. Grinnell College, Martha-Ellen Tye Foundation, ACT, Vermeer Corporation, Coralville Public Library, Friends of the Cedar Falls Public Library, Friends of the Waterloo Public Library, Friends of the Newton Public Library, Prairie Meadows, The Arts Connection Inc, CLIK. Design and printing costs for the final publication are sponsored by Grinnell College.